This custom-engraved flask is available in a choice of colors and made of stainless steel and sturdy, high quality faux leather. The flask holds six ounces of your favorite spirit and is not only personally engraved, but individually boxed for gift-giving. Available from Etsy. When life is all glitter and rainbows, reach for the unicorn flask! This eight ounce flask features a diagram of a unicorn’s structure, from giggles to wishes. Made of stainless steel, this flask is ideal for the dreaming drinker. Available from ModCloth. These real wood flasks will make a great personalized gift for the holidays. 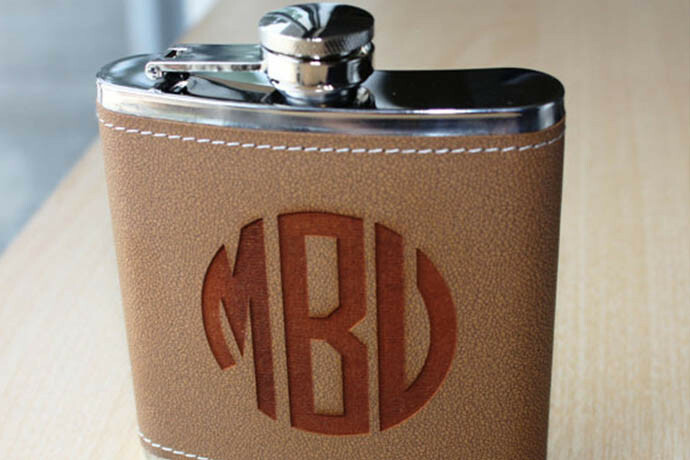 These six ounce flasks, with real wood wrap, can be personalized with full names, surnames, nicknames or monogrammed. The printing is done on real wood veneer. The wood is then sealed with a shellac to make it water and booze resistant. The flask can be wiped with a damp cloth, but should not be submerged. Each piece is unique and variations in the wood grain and shade should be expected. Available at Etsy. This stylish laser-etched glass flask has a swing-top lid and personalized monogram or name in a variety of styles. The flask holds 16 ounces and the lid has a rubber seal with metal clasp. Available at Etsy.